A delightful large, light ground floor studio apartment with spectacular private garden, canopied sun terrace and secure free parking. Sleeps 2 - 5. Close to local beaches. This Studio apartment is available to rent: - 2019: Good availability - please enquire.. If your dates don't match, please scroll down to the links for other villa and appartments to rent nearby. 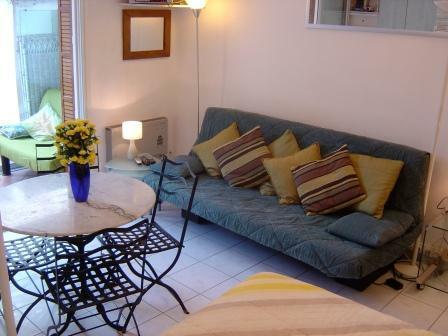 The studio apartment is located in Rue Jean-Cresp, a very quiet and private gated road in Cannes on the French Riviera within minutes walk of local beaches. The gardens are an integral part of this holiday rental and large patio doors open out onto the secluded terrace. 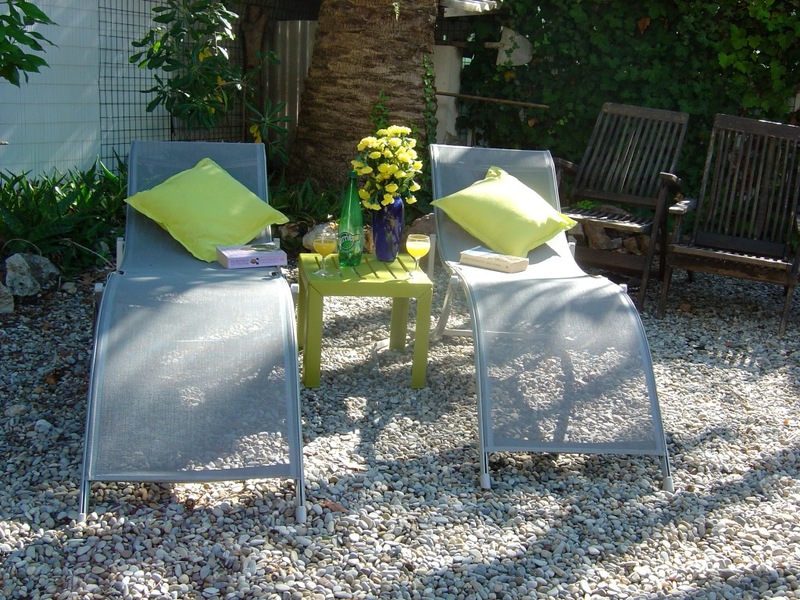 Although Cannes and the surrounding areas are a delight to explore it is inevitable that the gardens will be a memorable holiday moment of Provencal relaxation and tranquility. 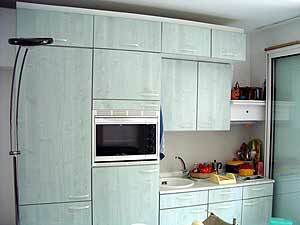 The studio apartment is furnished to a high standard with great attention to detail. There is a fully fitted kitchen at the front of the studio, which is convenient for meals indoors or under the sun-canopy outside. and bathroom with an additional kitchen area for outside entertaining. There are two televisions and a hot & cold shower under a bay tree for those after beach showers too! 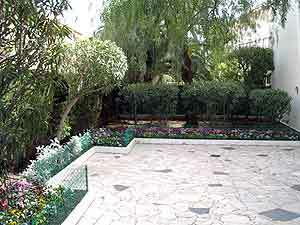 The tiled floor leads the eye out to the patio area, making the delightful gardens feel integral to the apartment. 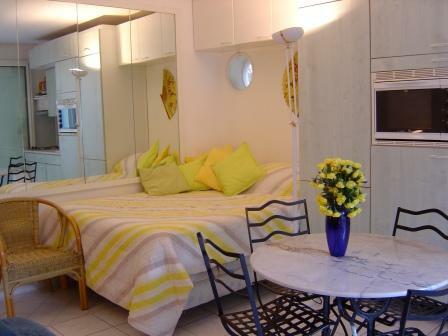 A feeling of light and space makes this studio apartment a very relaxing holiday base. 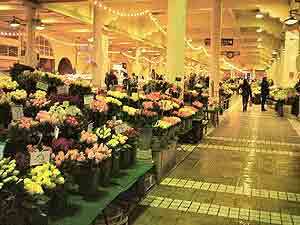 Nearby are several local supermarkets, a bakery, pharmacy, butchery and a Post Office. The Boulevard de la Croisette is a few hundred meters away and a minutes walk will take you to both Palm Beach & Petit Plage. Many other fine beaches are just a short drive or bus journey away. The Palais du Festival is a 10 minute walk away along the Croisette and the A8 bus runs in a loop from your gate to the town centre and back every few minutes. The Cannes Film Festival (Festival de Cannes) takes place each May. 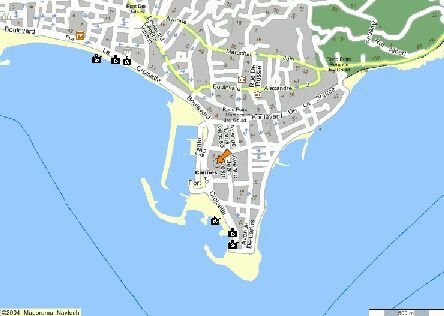 At the East end of the beach and promanade is Cannes marina. 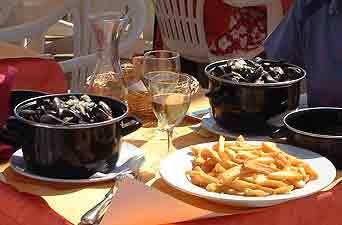 The choice of cuisine is not surprisingly enormous. 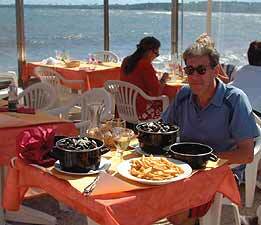 The sea food in particular is superb and 'discovering' new cafes and restaurants is always one of the joys of a holiday in Cannes. 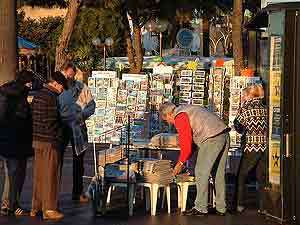 Flights arrive at Nice Airport, Terminal 2 and the Express Bus to Cannes takes about 30 minutes. 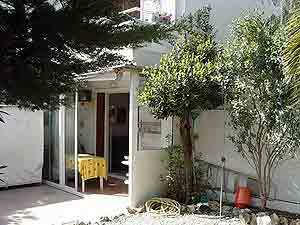 The studio apartment enjoys secure and free parking. If you hire a car from the airport you may wish to take the Autoroute to Cannes. 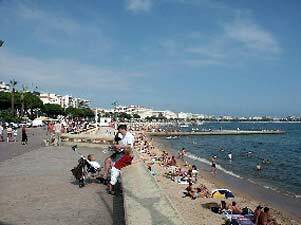 But as this is a holiday, so you should consider the slightly slower but more enjoyable N98 that skirts the Cap d'Antibes, follows the coast and brings you into Cannes along its promenade. Better still is the minor road that runs parallel to the N98. It affords the best sea views if you are prepared to be patient with the local traffic, and will immerse you in the atmosphere of the French Riviera. 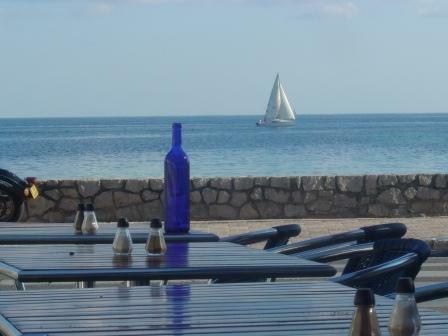 It will tempt you to stop, explore, take your time, and generally set you in a holiday frame of mind. 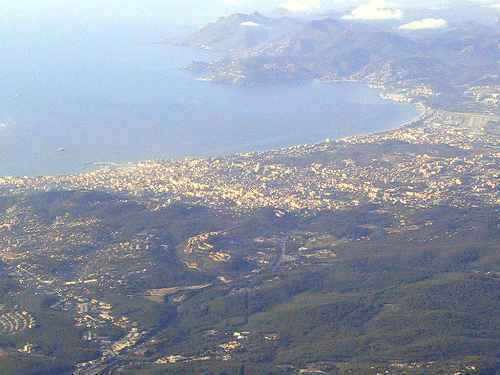 If you are flying into Nice airport during daylight hours, you may recognise the aerial views of Cannes and other famous Riviera destinations. The price range for this rental studio apartment is from 350 Euros to 865 Euros (excluding festival & conference weeks ). Please contact us for prices during the Cannes festival period.